Quotation is a formal statement setting out the estimated cost for a particular job or service. Quote Journey is the newer version of the Quote Form and can be accessed inside and outside the project. 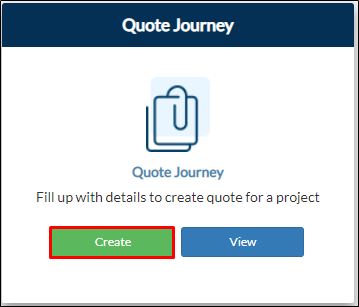 From your project page, go to Pre-construction tab > Create on Quote Journey tile. Type in 'Quote Journey' on the search bar located on the upper right corner of your portal. 2. You will be directed to the Quote Journey form. A banner will be displayed. This banner will display all the fields you need to fill out. Note: Required fields should be filled out first before proceeding. Otherwise, the Next Step button will be disabled. 3. Click Next Step to proceed on filling out other fields. On the last tab, you can either click Continue Tender to proceed to the other details of the quote or click Quote Template to get your quote template. 4. If you choose the Continue Tender, a new ribbon with the set of details will be displayed for you to fill out. This is used when you want to input more details to your quotes. 5. On the last tab of the ribbon, click Quote Tender to submit your quote.